A classy way to seat your guests, our sparkling modern place card frames add sophistication to your event tables. After the event is over, your friends and family can take one home to display a cherished photo. The contemporary design resin place card frame features a silver finish along with perfectly placed crystals. 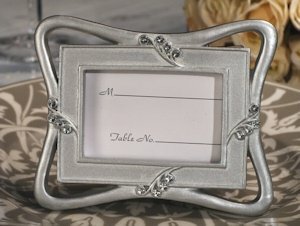 Frame measures 3" x 4" and holds a 2" x 3" photo or the included place card. Comes individually packaged in a plain white box. Will this stand vertically as well as horizontally? The Contemporary Design Silver Place Card Frame Favor only stands horizontally.